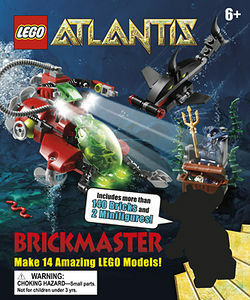 DKAtlantis Brickmaster Atlantis is an Atlantis Brickmaster Book released in August of 2010. Included are 48 pages with instructions to build 14 exclusive models with minifigures from the 140 pieces contained. Meet the Characters and Treasure Hunt pages. The scenario in its entirety. The sub with oxy hose. A rear view of the drill. The U-Boat with opened cockpit. The "Lobscare" from the front. This page was last edited on 15 March 2016, at 18:44.